Home announcements Apple iPad News iPad Mini Is Coming – Apple Store Down Again, Apple Events Channel Added To Apple TV! iPad Mini Is Coming – Apple Store Down Again, Apple Events Channel Added To Apple TV! 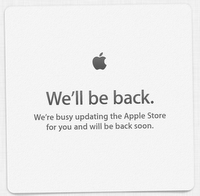 As it usually happens before the new product launch – Apple Online Store is down right now, with the notice saying they’re busy updating the store and will be back soon! This does hint that despite the updated iOS 6 versions we’ve discussed in our previous post, and along with the Apple’s role in education, the Fruit Company will definitely unveil the Mini version of its best-selling tablet –iPad! For those who own an Apple TV, there’s one more good news: Apple has silently added a new "Apple Events" app to the standard Apple TV home page and is set to stream today's media event live! So far this is the only way to watch the iPad Mini Keynote live. The company does not usually offer live video streaming for its media event – last time Apple did so was way back in 2010. However, streaming the event to the Apple TV is definitely a nice way to bring the event to the many eager viewers who are unable to attend the event in person. Stay tuned - we’ll cover the whole media event as soon as the pending details get clearer!